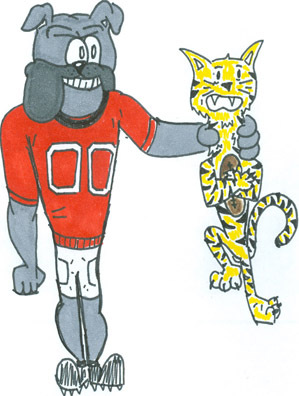 An Artesia Bulldog gets a hold on an Alamogordo Tiger in this drawing by Artesia High School senior art student Maegan Lemon. The ‘Dogs will close out their 2017 regular season today in their first home outing since Sept. 8 against the Tigers at Bulldog Bowl. Kickoff is set for 7 p.m.